Morning friends! Can't believe we're already 3 weeks into the Perfect 10 Quilts sew along! This week's blocks are fun, first cup.. 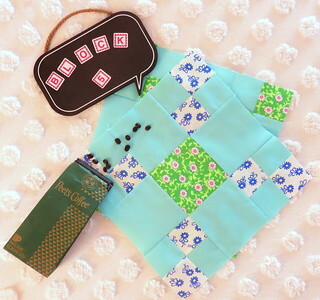 I mean first up... is the Coffee Block. You make two of them and they're fast! I love using the blue background so my white prints pop. That print there is a favorite. This line, Flower Sacks, has a lot of tone on tone prints, I really like this swirly one. It's a nice resting spot for your eye between the prints, but also has some movement to it. And it's just fun so there's that. 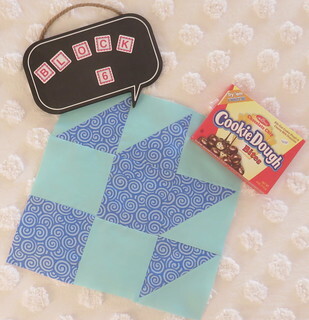 Cookie Dough is a fun block, and if you join 4 segments together you get a nice block, you can check out this kit for an example. The kit is made using Sherri and Chelsi's new line Walkabout which is coming soon. Love them, you have a perfect sense of color!!! Sweet. #5 colors are my fav. Love the white print with the little blue flowers.